Feast on a lavish buffet lunch or dinner at the enticing Kaleidoscope restaurant at Atlantis The Palm in Dubai. Specializing in generous international buffets of delicious Arabian, Asian and Mediterranean cuisine, the Kaleidoscope offers everything from live cooking stations to fresh seafood, curries, carveries and more; and views of the Atlantis’ stunning fish-filled aquariums. Just take your pick from the tempting, all-you-can-eat selections and relax in the comfortable surroundings as you lunch or dine. Ideal for families and couples, with hotel pickup and drop-off included. Choose between a lunch or dinner experience when you book. 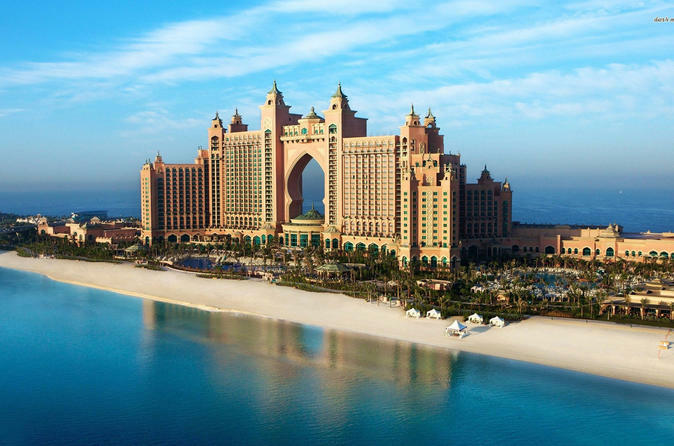 Then, on the day, enjoy a hotel pickup and travel to the Atlantis The Palm on Dubai’s Palm Jumeirah by air-conditioned vehicle. On arrival, marvel at the scale of the magnificent hotel and make your way to the Kaleidoscope restaurant. Be shown to your table and head for the tempting buffet counters and live cooking stations, where skilled chefs will prepare your choice of foods on the spot, specially for you. Choose from the vast array of international and local dishes, tempted by the exotic flavors and staples from almost every corner of the world (see the Itinerary below for sample menus). Select everything from exquisite sushi and mezze appetizers to just-caught seafood, juicy roast meats, hearty pastas and Chinese dim sum, noodles, curries and much more. For desserts, cast your eyes over the selections of exquisite pastries, sweets and cakes, and at dinner, help yourself to the indulgent chocolate fountains that are added to the tempting offerings. Enjoy the relaxed atmosphere as you eat, and be sure to take a closer look at the colorful marine life on show at the restaurant’s aquarium viewpoints. After your meal, enjoy a drop-off back at your hotel, bringing your lunch or dinner experience to an end. Wide variety of Italian dishes will be displayed in hot chaffing dishes.